The quartz-crystal microbalance (QCM) biosensor allows a label-free detection of biomolecules in liquids through the change in resonance frequency of the quartz oscillator. Its sensitivity can be drastically improved by thinning the quartz oscillator, but this was never achieved because of electrodes and wires attached on the crystal surfaces. Dr. Hirotsugu Ogi has, however, overcome this difficulty for the first time: Instead of wire connections, he excited and detected the intended vibration of the crystal by antennas through electromagnetic waves. This noncontacting measurement is the key not only for ultrahigh-sensitive detection of proteins in liquids but also for realization of packaging of an isolated quartz crystal in a microchannel with a microelectromechanical systems (MEMS) process. 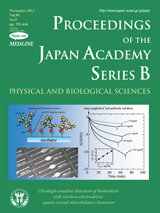 The cover figure includes a photograph (the left-lower photograph) of such a MEMS-processed quartz crystal biosensors. 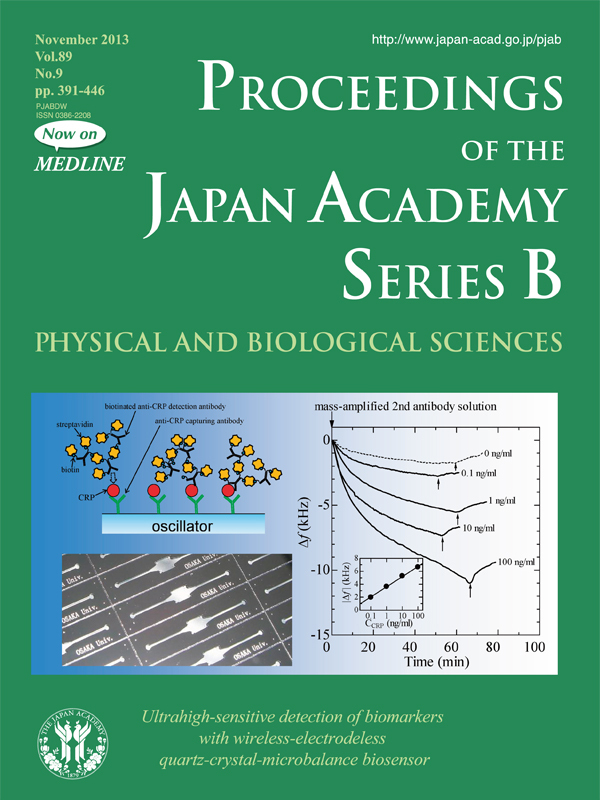 The cover figure shows an example of the high-sensitive detection of biomarkers with a wireless-electrodeless QCM (WE-QCM) biosensor. The C-reactive-protein (CRP) was detected by the mass-amplified detection-antibody solution after the injection of the solution with various CRP concentrations using a 180-MHz WE-QCM biosensor. Because the QCM is a mass-sensitive biosensor, its mass sensitivity is increased by the mass-amplified sandwich assay, and the mass of the detection antibody was increased using streptavidins. The left-upper figure illustrates this assay mechanism. The binding curves observed for the injection of the detection-antibody solution are shown in the right figure. The inset in the right figure shows the correlation between the frequency change and the CRP concentration at 20 min.